For anyone new to eCommerce, or indeed new to Magento, it can be quite daunting getting to grips with the various different product types available in Magento. We’ll discuss some of the less commonly used product types in a future article, but today we will tackle the difference between simple and configurable products, with some best practice recommendations to ensure your product catalog stays manageable and easy to navigate. A simple product in Magento is a physical product that is shipped to a customer. Services such as a business review or downloadable items such as an e-book or an app do not count as simple products. A simple product might be, for example, a lamp, or a vacuum cleaner. It has no options attached to it such as size, colour or material. Each simple product will have its own unique SKU, its own unique URL, and its own inventory count (assuming the store is actively managing inventory levels). A configurable product is an item that requires the customer to choose one or more ‘options’ prior to purchase. For example, when buying shoes, the customer needs to select what shoe size they want to buy. Many clothing items may well have both colour and size choices that have to be made by the customer. It’s possible within Magento to specify different prices for some or all of the configurable options in a configurable product. As an example, some store owners might wish to price small, medium and large T-shirts at one price, with XL sizes and above priced slightly higher. Magento can handle this with ease. In Magento, each option combination of an item is stored as a simple product, with a configurable product being created to act as the ‘parent’ product. For example, if you sold a rucksack that was available in black, blue, red, green and grey, there would be 5 simple products created, one for each colour. A configurable product would then pull the simple products in to form the customer colour options. SKUs and inventory counts would be specific to the simple products. Since Magento 1.9, configurable swatches can be created for each configurable option, so for example instead of a drop down option list for colours, the customer is shown a swatch of actual colour boxes from which to make their selection. These can be time-consuming to set up, but the increase in sales conversions where configurable swatches are used should more than compensate for the extra time needed in product set-up. Taking things one step further, it is also possible for the main product image to change dynamically to reflect the option selected by the customer, for example so that when a customer views a t-shirt, and selects ‘red’, the main product image changes from the default image to the red t-shirt image. This can be achieved via custom coding or an off-the-shelf Magento extension. When planning your catalog set-up in Magento, it’s important to take time analysing all of the selectable options you are likely to need, and grouping them into related sets. In Magento, these selectable options are called attributes, and can be grouped into attribute sets. Options such as colour and size are easy to understand attributes. You may want to further split things down into several attributes, for the sake of clarity. For example, a clothing retailer may want to differentiate between shirt sizes, hat sizes, shoe sizes and belt sizes. In this scenario, an attribute would be set up for each different type of ‘size’. Since a product can only be linked to one attribute set, it’s important that an attribute set contains all the attributes needed to set up that product. It’s important not to rush the set-up of attributes and attributes, as otherwise the product catalog can become very confusing for operations staff. This will show a popup window to add the new product into. All fields will be blank for you to add the option based product data. This will need to be repeated for each option. Again, a popup window will display, but this time all key data will be copied from the ‘parent’ configurable product, for you to amend or add to as necessary. If all the details are to remain exactly as for the configurable product, with the exception of SKU, the product option (attribute), inventory and optionally price, then this is the fastest method for adding simple products to a configurable product. 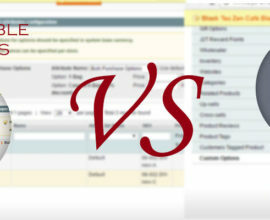 It’s important to remember that the configurable product must be saved before you try to add associated simple products, and also that after adding associated simple products via this or either of the other two methods, the main configurable product must be saved before changes are applied to the Magento database. Finally, in order to avoid duplicate content penalties, along with customer confusion, it’s important to set the visibility of the associated simple products to ‘Not Visible Individually’. Otherwise all of the simple products would be shown in the category pages and search results, as well as the configurable product. 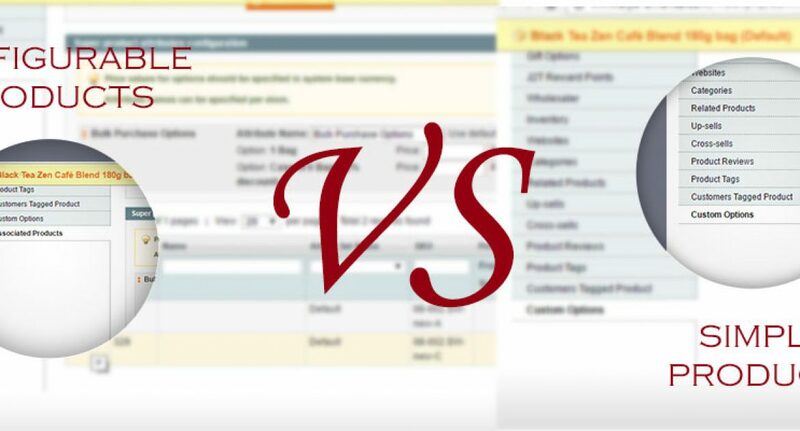 Whilst attributes and attribute sets may well be a topic for a future article, hopefully this feature has provided an overview of the key differences between simple and configurable products in Magento, to enable effective and organised catalog creation.